You don’t have to be in the Church of God very long to know we’re a singing church. We always have been. New Beginnings Church of God in Albuquerque, New Mexico, is just one example of that. The song in the air over Albuquerque today is simply a natural overflow of the song of salvation which God placed in the hearts of the believers at the thriving church situated at the base of the rugged Sandia Mountains. Their recent Christmas caroling outreach in one of the most socioeconomically challenged areas of the city is only one of numerous reasons more and more people are joining in the heavenly refrain. 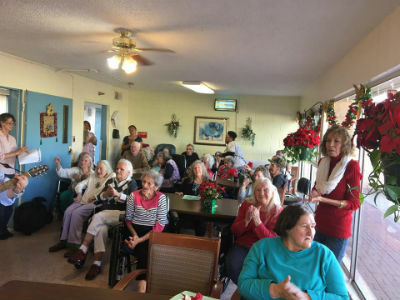 Photo: Residents of South Valley Care Center listen to the carolers. Eyes light up and smiles replace lingering frowns among residents of South Valley Care Center when members of New Beginnings Church enter the room. Spirits are lifted and hearts are warmed, but feet are warmed, too. Coordinating with the local Christian television station, New Beginnings Church of God collects socks throughout the season to give to these elderly residents. Instead of assuming what they need, the church asks the nursing home what the needs actually are. Because socks wear out easily, and because the residents’ feet get cold quickly, socks are one of the greatest needs. Additionally, the church donates coin purses, which come in handy, not just for coins, but medicine and other trinkets. Aprons were also among the gifts presented to the residents this year, as several ladies from the church got together and put their quilting skills to work for the cause. There’s a song in the air over Albuquerque. It’s coming from New Beginnings Church of God, and it’s changing lives with the hope of Christ at Christmas and throughout the year. 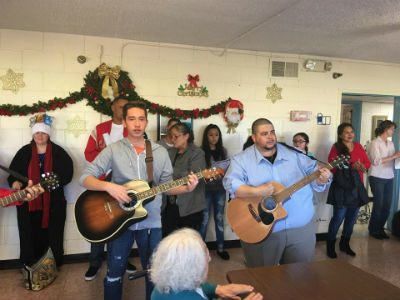 This entry was posted in All Church of God, Western and tagged Albuquerque, caroling, Christmas, Hispanic, New Beginnings Church of God, New Mexico, nursing home, outreach, singing, urban. Bookmark the permalink.